Classic Chorus 130, Solid-State Combo Guitar Amp from Peavey in the Classic (Discontinued) series. 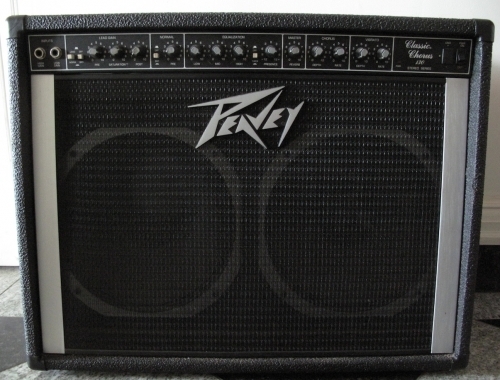 MGR/Billy's review"Peavey Classic Chorus 130"
My first guitar amp! I remember it fondly. I worked all summer to save up for my first big, loud mean guitar amp. Then...I broke my arm. My father took pity on me and offered to help me out. He took me to the music store and I picked up the biggest, loudest amp there was! I was in my local music shop. It was used. I bought it in 1997, I'm going to guess this amp is from the early 90s. I paid $100 for it. More power than anyone could ever use. The EQ was very tweakable. I cannot remember it off the top of my head as I don't have the amp anymore. I believe it had the standard 3 or 4 knob EQ for each channel and I believe there was a bright switch. Master Volume on the clean and I think a Pre and a Post for the dirty channel. Heavy, Heavy and more Heavy. 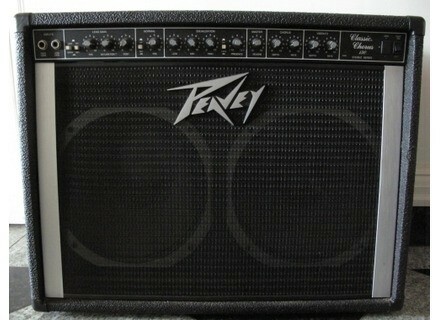 Ever notice Peavey looks similar to the word heavy? This amp had to weight 100 pounds. When I was a young teen it probably weighed as much as I did! The distortion channel wasn't anything to right home about. I mean I loved it when I was 14 or so, but soon realized the amp wasn't going to get me to sound like my idol at the time Mr. Stevie Ray Vaughan. Built so tough that if a Mack truck traveling at 60 mph hit it, the truck would explode and I could still plug this thing in and fire it up. If you dropped it down your steps, your steps would break, not the amp! I loved the fact that I could count on the amp. Too made more companies don't build things with Peavey's quality control. Sure sign of the 80s. Loud, Heavy, Reverb and Chorus! Man I really wouldn't mind ripping through some Van Halen on that amp one last time. If you packed one of these away in a time capsule, in 100 years you could dig it up and I am certain this amp would still crank up! MGR/Jason's review"Peavey Classic Chorus 130"
not to get me wrong my strat is magic on that thing too nice iron madien tone fr aces high. but one more point on the amps distortion Its really captures the corrosion of conformaty loose tone so its not all bad in heavy metal tone.